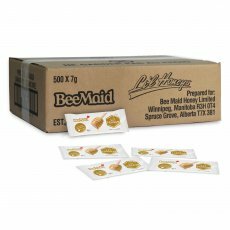 As one of Bee Maid Honey�s most popular products, Bee Maid liquid honey is known around the world for its high quality and clear, delicate flavour. Simply scrumptious in your tea or on your morning toast, Bee Maid liquid honey is also fantastic as a glaze for veggies or meat dishes, and for making delicious marinades or salad dressings. Bee Maid liquid honey is packaged conveniently with you in mind: our trademark beehive bottle is perfect for baking and makes it easy to add a healthy spin to your recipes, our traditional bear bottle is perfectly at home next to the tub of peanut butter and our smaller sleek oval bottle makes teatime extra sweet. Go right ahead and choose the size and shape of Bee Maid liquid honey that�s best for you! And for use at large events pick up one of our 3 kg Bee Maid liquid honey containers.